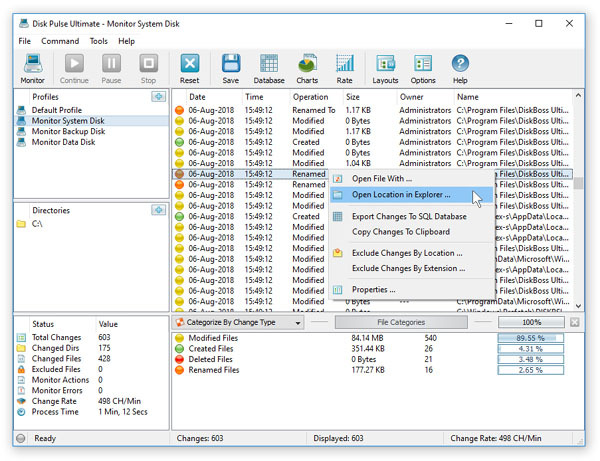 DiskPulse is a powerful real-time disk change monitoring solution allowing one to monitor changes in one or more disks and directories, send E-Mail notifications, save various types of reports, generate statistical pie charts, export detected changes to an SQL database, send error messages to the system event log and execute custom commands when a user-specified number of changes detected. DiskPulse intercepts file system change notifications issued by the operating system and detects newly created files, modified files, deleted files and renamed files. All file system changes are detected in real-time allowing one to send an E-Mail notification, execute a custom command and/or save a disk change monitoring report within a couple of seconds after one or more critical changes detected. 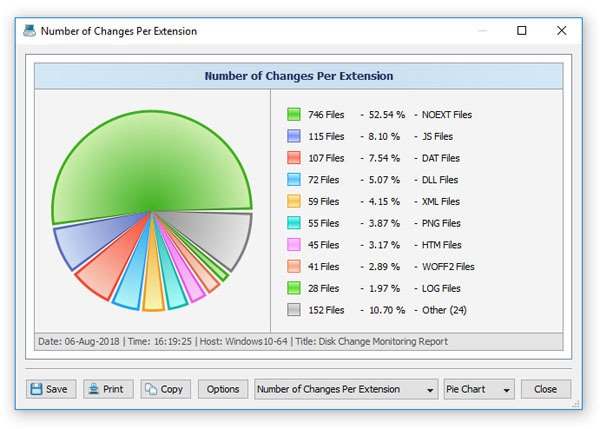 The user is provided with the ability to review, categorize and filter detected file system changes, generate various types of statistical pie charts showing the number of changes per file extension, the number of changes per change type, the number of changes per user, etc. In addition to the GUI application, DiskPulse Ultimate and DiskPulse Server provide a command line utility, which can be used to execute disk change monitoring operations locally and control one or more DiskPulse Servers through the network. 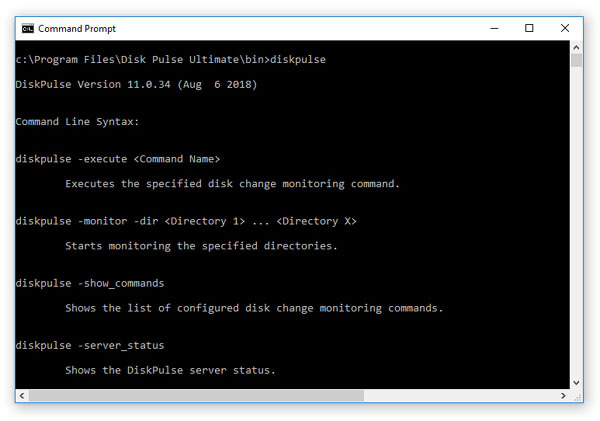 The DiskPulse command line utility provides the ability to control disk change monitoring operations from shell scripts and batch files and allows one to integrate DiskPulse capabilities into user-custom solutions. IT professionals and enterprise customers are provided with DiskPulse Server - a server-based product version, which runs in the background as a service and can be controlled using a full-scale client GUI application or a command line utility locally or through the network. 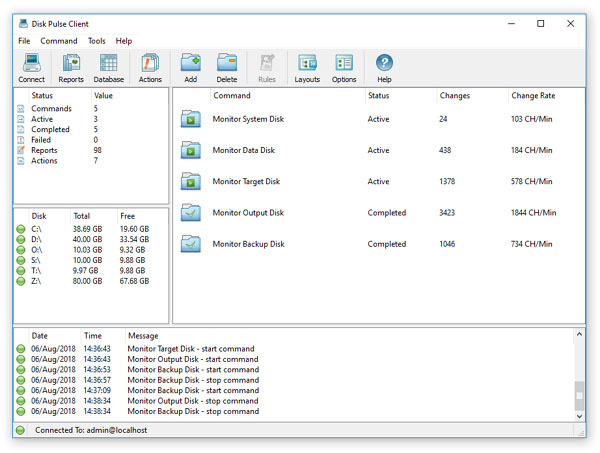 DiskPulse Server allows one to monitor multiple disks or directories simultaneously, send disk change monitoring reports to a centralized SQL database and generate history trend analysis reports. Finally, corporate customers are provided with the DiskPulse Enterprise product version, which is capable of receiving disk change monitoring reports from multiple production servers, searching critical changes across the entire database, analyzing reports using a centralized set of user-defiled rules and policies and sending E-Mail notifications when critical issues are detected in one or more disk change monitoring reports received from production servers.